Be honest: is your business actually getting anything out of its social media presence? But bear in mind how difficult it is for brands to wrap their heads around the ROI of social media. 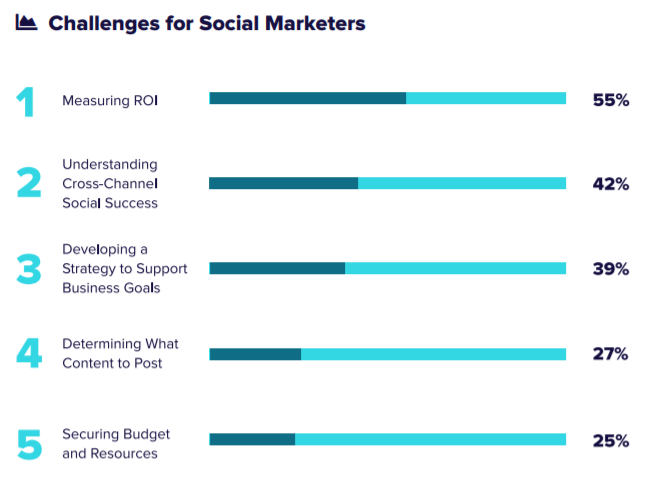 In fact, 55% of social marketers cited measuring ROI as their number one challenge in 2018 according to our own data. If you’re struggling with social ROI yourself, we totally get it. Measuring the return on metrics such as engagement rate or customer satisfaction often feels like a guessing game. Besides, not everything you do on social media translates directly into dollars and cents. Yet at the same time, businesses need to be held accountable for the time and resources that go into their social efforts. That’s why we put together this guide to help social marketers determine and define social media ROI based on their unique online presence once and for all. To skeptics, social media has the reputation of being a total time-sink. Sure, it’s true that businesses can pour hours upon hours into their social without seeing much in return beyond a few vanity metrics. On the flip side, so many brands are killing it with paid and organic campaigns alike. There’s also a universal expectation for businesses to have some sort of social presence whether it be for customer service or brand awareness. And beyond accountability to your boss, effectively measuring your social media ROI can help inform you how to improve your campaigns for engagement. If you want to squeeze the most out of your valuable time to attract and convert customers via social, you need to define what you’re trying to get out of your presence. With that, we dive into the meat of figuring out your social ROI. Let’s be clear. Social media ROI is not some sort of one-size-fits-all affair. When we think “ROI,” we often default to thinking about money. Cash. Moolah. For example, raising brand awareness is a perfectly good reason to invest in social media. Brands like Ben & Jerry illustrate that there’s more to social than just pushing products. You also have brands who are primarily concerned with customer service and community building. Timely back-and-forth with customers is key to retention. Failing to pay attention to customer concerns via social could result in someone bouncing to a competitor. In this sense, customer service can provide a massive ROI with just a little bit of effort. Of course, there’s a wealth of brands that are running frequent social ads targeting specific customers. These businesses are rightfully concerned about making the most of their ad spend. Heck, you could be doing all of the above. Many brands are, actually. The takeaway here is that is no single way to use social media effectively. To define your social media ROI, you need to first break down the “why” of your presence. This could ultimately frame how much time or money you’re willing to invest in the first place. Getting a return on that investment means understanding your performance. But to do that, you need a data-driven endgame. Reality check: it’s impossible to measure your social media ROI without keeping a close eye on your metrics. In our guide to building a better social media presence, we discuss the need to set measurable, realistic goals. The same rules applying to uncover your social ROI. Note that all of these goals are based on someone taking a measurable action that can be tracked. Metrics like social shares, followers and general traffic are worth tracking but they shouldn’t be your main goals. Unless you’re focused solely on engagement and awareness, these metrics don’t drill down deep enough for assessing ROI. In order to get the most accurate numbers for your social media ROI, it pays set your goals based on defined actions. Specifically, actions that convert a casual browser to a lead and ultimately to a paying customer. Someone clicking a link to your site in a Tweet is always nice, but tracking such interactions shouldn’t stop there. For example, you need to know whether or not those clicks are resulting in sales or other meaningful interactions. Rather than look at the big picture of your social presence, social goals should be campaign-specific. This is a critical aspect of measuring ROI that so many marketers miss. A campaign is a planned out effort with set goals and a measurable outcome. Here are some awesome examples of social media campaigns to help inspire you and clue you in on what we’re talking about. For example, any brand running a paid Facebook campaign should know whether or not their ads paid off. Through analytics the answer is fairly straightforward. One of the most important reasons you want to set up campaigns is that it will allow you to track individual links that you share on Twitter, Facebook or other networks. This allows you to easily attribute visits from specific links you share. For example, brands on Instagram oftentimes update their bio link to coincide with whatever their most recent promotion might be. Rather than use a generic link, URL trackers help tie clicks to specific campaigns and calls-to-action. Check out how Topshop tracks whether Instagram followers are converting to shoppers via the Curalate link in their bio. Beyond the likes of Bitly, you can set up campaign-specific links through Google’s URL builder so the information will be included in your Google Analytics reporting. Check out our guide to UTM tracking for an in-depth look at how to track your campaigns this way. Once you’ve defined your goals, the next step is to track them. The tracking part is why it’s so important to set up goals that are based on your visitors taking action. The easiest way to track your social media goals is by using Google Analytics. Although Google Analytics can clue you in on social traffic and which channels are driving traffic, you can get much more granular than that. For example, what if you want to see the financial social ROI for a specific campaign? Google has you covered. This is where you’re going to set up the goal you defined earlier. If your goal was to get newsletter sign-ups, you’ll have to set up a special thank you page on your site for after someone subscribes. But if your goal was to increase time on site for Twitter users by X%, or to get traffic from Facebook to watch a video on a landing page, you’d choose the appropriate goal type. 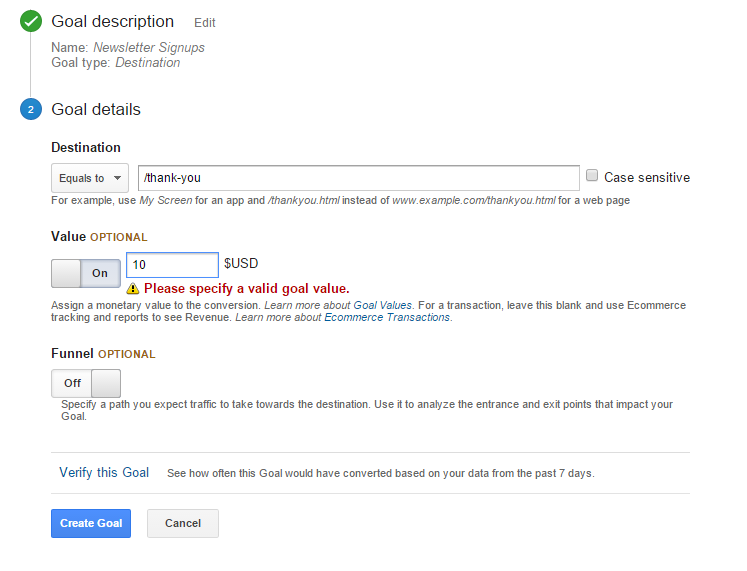 For this example, we’re going to set our goal type as a destination page. For this part, you’re going to enter the actual destination URL that you want to trigger a conversion. Make sure this page is not indexed in Google, so that the only way for someone to land on it is by going through your email signup process. Otherwise you could potentially muck up your data. Lifetime value x conversion rate: Calculate the lifetime value of a customer, and multiply that by your conversion rate (average number of email subscribers who become customers) to find out what the potential value of each visit is. Average sale: If the goal of your campaign is to try to get sales, then you’ll want to calculate your average sale amount and set that as the value. In this case, your destination page would have to be the page that shows up after a customer completes a purchase. In order to figure out whether you’re getting a positive or negative ROI for social media campaigns, you’ll also have to measure how much you’re spending. That spend doesn’t just encompass money, though. Here’s what should be included in your ROI calculations. Time: Your time is valuable. Whether you’re a solo business or you have a social media team, add up the hours that go into a specific social media marketing campaign over a specified period of time. Don’t just use an employee’s annual salary, though, as they’re more than likely going to be working on several projects throughout the year. Measure this investment per-campaign. Content: Did you get a landing page written by a professional copywriter? Or maybe you outsourced status updates. These costs are easy to overlook but they certainly count. If you’re writing such copy yourself, that’s going to count toward your time investment. Social media tools: Using Facebook and Twitter is free, but if you’re using a tool like Sprout Social or other social media management software, you need to add those costs in. Just like with the hours, you should calculate this on a per-campaign basis. So if your campaign lasts for one month, only add in the cost of a month of the software, not an entire year. Ad costs: If you’re running a Promoted Tweet, Facebook Ad or boosting a Facebook post, add in that cost as well. This is fairly easy to track as you set up your ad budget. Earnings are based on the value you calculated in the previous section. Your costs are the items listed above (hours, content, etc). You can figure out the specific ROI for each social network by segmenting your earnings and costs per social channel using that same formula above. After looking at the numbers, you’ll be able to decide which social platforms are doing the best for your company and hone in on those. For any social networks or campaigns that are bringing in a negative ROI, you can either try to adjust by spending less or fine-tune your campaigns. On that note, let’s quickly cover some additional pointers for stepping up your social ROI. As noted, so much of measuring your social ROI boils down to your metrics. 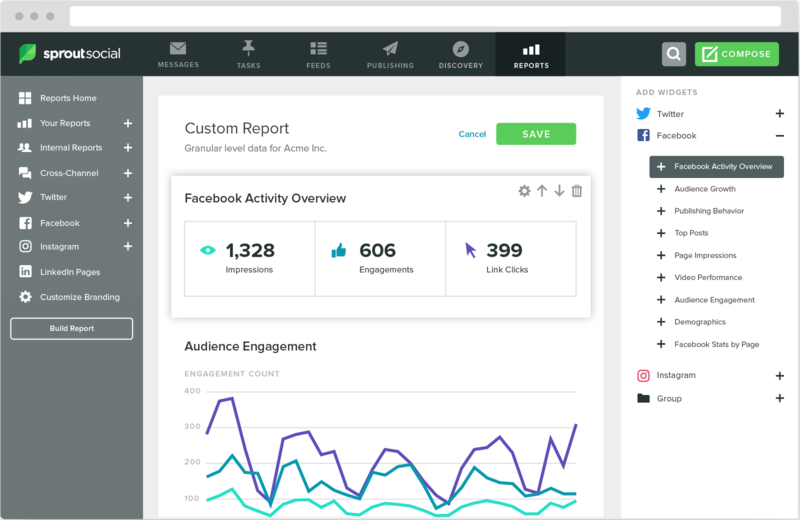 Beyond Google analytics, take a hard look at your social dashboards to understand your performance. For example, which types of content are your top performers? When are you getting the most engagement? These data points can be make-or-break for paid and organic campaigns alike. The more data you have on hand, the easier it is to maximize your reach and get a better ROI for your efforts. Tools such as Sprout are invaluable for mining your data to figure out these data points that go beyond the likes of your native analytics. Not only can you get a look at all your channels in one place, but you can use features like tagging to group together all the messages in a given campaign to compare and contrast performance. This can help you pinpoint what is and isn’t connecting with your audience so you can adjust your campaign planning accordingly. Marketers today are expected to run a variety of campaigns, paid or otherwise. Before going all-in on a particular campaign or ad type, you can save yourself time and money by running a test first. 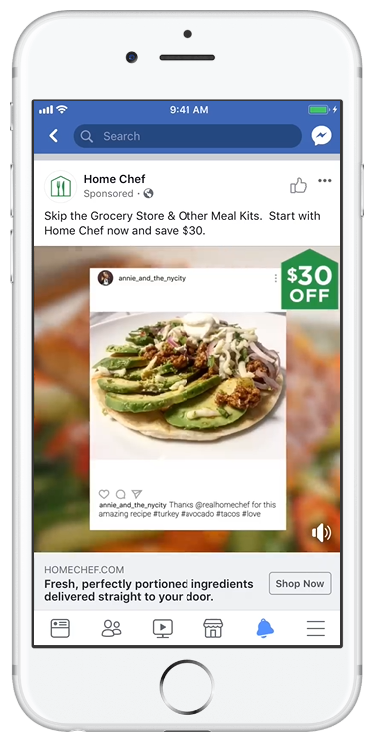 This is especially important for paid ads like those on Facebook that can quickly blow out your budget if you aren’t careful. Check out our comprehensive guide on testing on social media to learn more about what it takes to run an effective test. Thankfully you don’t need to use a ton of tools to assess your social media ROI. We’re all about keeping things lean and taking a DIY approach when appropriate. And with that, you have everything you need to break down your social ROI! How are you measuring your social media ROI? Knowing exactly what you’re getting out of your social media presence doesn’t have to be a huge question mark. For the sake of efficiency and accountability, businesses must define and measure their social ROI. This does double duty of ensuring that your campaigns are focused on goals and that your resources are going to the right places. We want to hear from you, though! What are you doing to measure your social ROI? Any additional tips or tool you’d recommend? Let us know in the comments below.